I mean to cross this country….. I mean to cross this country, Mr Landells. A postgraduate student from James Cook University in Cairns is jumping feet-first into his doctoral research, by walking from Melbourne to the Gulf of Carpentaria — a journey of 3,250 kilometres. History student David Phoenix will follow the route taken by explorers Burke and Wills, whose tale of bravery and blunder ended in death at Cooper Creek in 1861. By placing himself in the landscape traversed by the two explorers, travelling at a similar pace and at the same time of year, Mr Phoenix hopes to gain insight into the role the landscape played in how the expedition progressed, and why it ultimately failed. Mr Phoenix said test walks conducted in two previous research projects, in which he examined the expedition’s records while travelling the route, had shed fresh light on the story. “It’s often supposed that after returning to the Dig Tree, the explorers didn’t travel far, but in fact they made a couple of lengthy journeys in an attempt to save themselves,” he said. “They were trying to find Strzelecki Creek which would lead them to safety. After walking the area with Wills’ journals and other records, it’s clear to me that not only were they unable to identify the creek, but at one stage they actually walked across it. Although land use along the route has changed since 1861, Mr Phoenix said much of the topography remained unchanged. “The landscape can tell us a lot about why they made the decisions and choices they made,” he said. Burke and Wills were the first explorers to cross the continent, and Mr Phoenix has been unable to find records of anyone who has walked from Melbourne to the Gulf in the century and a half since. He expects his journey to take six months, walking six days a week. Although he is leaving Melbourne at the same time of year, his walk is not a re-enactment of the famous expedition. “I won’t be taking 19 men, 27 camels, eight pack horses, one riding horse, six wagons and 34 wagon horses,” he said. “I’ll have a friend driving a 4WD support vehicle, and we’re travelling on a shoestring budget. David Phoenix will depart from Royal Park, Melbourne, at 4.00 pm on Friday, 1st August. 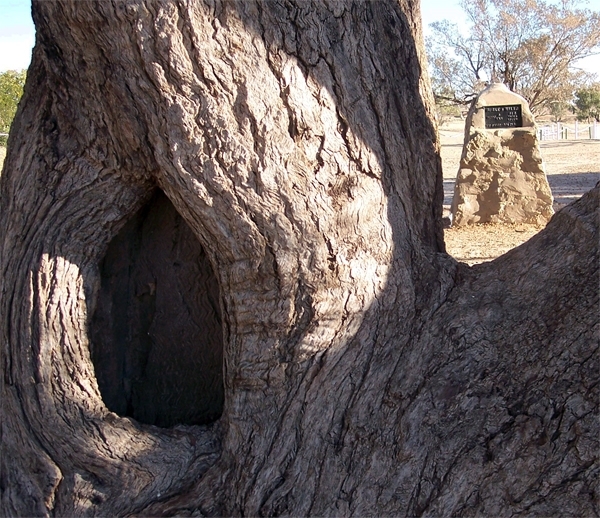 Burke and Wills left the Park at the same time of day on 21 August, 1860. ‘Reckless’ from the EP Semantics, © 1983 by James Reyne / Aussie Crawl. While I was out walking the dogs this morning, strolling through the bush and watching the wallabies hop around, I could hear the cars in the distance speeding by on their way to work and it got me thinking how we have much greater mobility than previous generations and how our concepts of travel, speed and distance are vastly different to those of Burke. A little over a hundred years after Burke rode his horse ‘Billy’ out of Royal Park on his great journey of exploration, Frank Borman, James Lovell and William Anders were on their own journey of exploration. 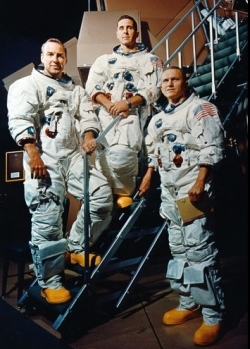 At 15:41:38 UTC on 21 December 1968 Michael Collins, duty CAPCOM at Mission Control Centre in Houston, radioed through to Commander Borman, “Apollo 8. You are go for TLI”. Permission had been given for the crew to ignite the third stage of their Saturn V rocket for a 5 minute 17 second Trans-Lunar Injection burn to take the spacecraft out of earth orbit and on its three day journey to the moon. The burn accelerated Borman, Lovell and Anders to 38,958 kmh, the highest speed ever achieved by humans. In 1860 the highest speed Burke could have imagined was the rush of wind and the drumming beat of the hooves of his horse as he galloped around the diggings in Castlemaine. There were no motor cars in 1860 and the internal combustion engine was still in its infancy. The new steam train introduced into Melbourne six years earlier took people from Flinders Street to Sandridge at an average speed of 24 kmh, which was about the top speed a team of five horses could pull a Cobb & Co coach, although the average speed for the coach was nearer to 8 kmh. Wills’ 1852 voyage from Dartmouth to Melbourne aboard the SS Janet Mitchell took three months and two days. In August 1989 the same journey was achieved in 0.8% of that time when Qantas 747-400 ‘Longreach’ VH-OJA flew the 18,001 km from London to Sydney non-stop in 20 hours, 9 minutes and 5 seconds. However international flights were not an option to Wills, manned flight was limited to balloon ascents from George Coppin’s ‘Cremorne Pleasure Gardens’ on the banks of the Yarra at Richmond and Wills would have been dead for more than 50 years before the first airplane flew in Australia. Travelling at high speed was a very different thing in 1860 – Burke took 123 days to cover the 3,250 km from Melbourne to the Gulf. Today one can drive it in 3 days or fly it in 3 hours. The crew of Apollo 8 covered the same distance in 300 seconds. Just a quick additional thought…Wills used a sextant for navigation and so did Apollo 8. Apollo 8 was the first manned spacecraft to leave the earth’s orbit and each time it passed around the dark side of the moon radio and visual contact with earth was lost for ten minutes. NASA wanted to ensure if the communications systems failed, the astronauts would be able to navigate themselves back to earth. In order to do this a sextant was built into the spacecraft and each mission had an assigned navigator; in the case of Apollo 8 this was Command Module Pilot Jim Lovell (who later commanded Apollo 13). Lovell used the sextant during the mission for practice but found that the fuel they had vented from the fourth stage booster rocket hung around the spacecraft and looked like additional stars which made it difficult to use the sextant anywhere other than in the moon’s shadow. 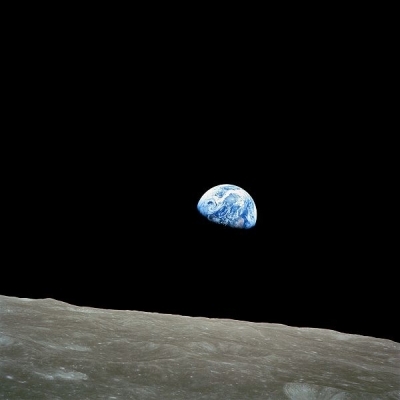 taken by Anders on the Apollo 8 mission. I’m going down to the waterhole….